First of all, THANK YOU to all the fabulous people who made aprons for the first-ever CraftSanity Apron contest and show to benefit Safe Haven Ministries! Today was the deadline for entries and WOW! More than 50 one-of-a-kind aprons featuring men’s neck ties were entered into the contest and I’m so impressed. Many of the designs took hours and hours to create and they’re all being donated to charity. How great is that? These aprons are going to help a small West Michigan charity continue to help women get away from their abusers and on with their lives. 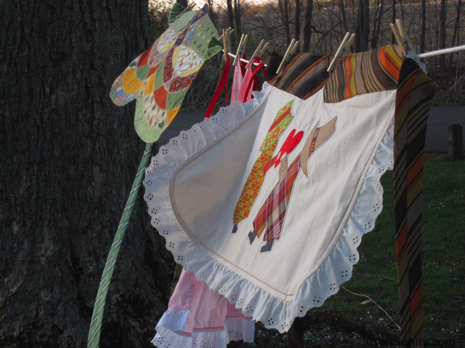 These aprons symbolize a second chance for women and children who deserve nothing less than safety and respect. But even more important than the money these aprons will raise in my community, is the message they send. If someone is hurting you or a loved one, there is help and hope. In West Michigan you can call Safe Haven at (616) 452-6664. Or, if you live somewhere else in the U.S., call the 1−800−799−SAFE for the National Domestic Violence Hotline to find help in your area. I’m so feeling the apron love right now and thrilled to have found a way to use my apron addiction to help a local charity as part of may Fifth Third River Bank Run Road Warrior Mission. I’m cooking up a plan to allow you, dear blog readers, to get in on the silent apron auction. (If you’ve ever hosted a silent auction on the web, please feel free to share your tips.) So stay tuned for updates. I’ll post a Flickr gallery of the show after the opening on April 30. There’s a lot of work to be done and thank goodness there is a small army of Safe Haven volunteers working behind the scenes to make this show a reality. Okay, I better hop to it. I still have to make my aprons for auction. But thanks again, folks. I have more BIG, fun ideas bouncing around in my head and this apron experience makes me believe that some of those dreams may become reality, too. It’s like apron magic has taken over. Those of you who wear aprons as fashion accessories know about apron magic, right? Do what you love to help people, and the universe will respond in kind. Make BIG, fun plans and you’ll meet wonderful people who will want to help you. And if your experience is anything like mine, you’re going to have a blast. This net internet site is actually a walk-through for all the information you wanted about this and didn’t know who to ask. Glimpse here, and you’ll absolutely discover it.